An intimate Christmas season birth. Who knew birth could look so sensual?! When a client who has already established care then finds out she’s having twins, there are many possibilities. This time, all those possibilities turned into magic. Do you know that women are strong & capable? She can take a walk around her neighborhood while in labor & find comfort in ways that don’t involve sedatives or anesthetic. Do you know that men can be nurturing and supportive? Instead of an “extra” person to just be shoved behind an IV pole. Do you know that older children can find joy and purpose in being present during birth? That they are not destined to be traumatized. Do you know that birth can safely occur in the comfort of your own home? Without the need to frantically drive to the hospital or birthing center. Do you know that your provider can be a loving part of your family? Instead of someone you need to fight in order to make your own choices. "Why the video? The day my baby is born is a special day, a special event. It's not just something to get through (the way I felt with my first two), but a life event I am looking forward to celebrating and that’s why I decided that hiring the most amazing photographer I can find was going to reframe the feelings surrounding the event into a celebration that’s meant to be enjoyed and remembered fondly." 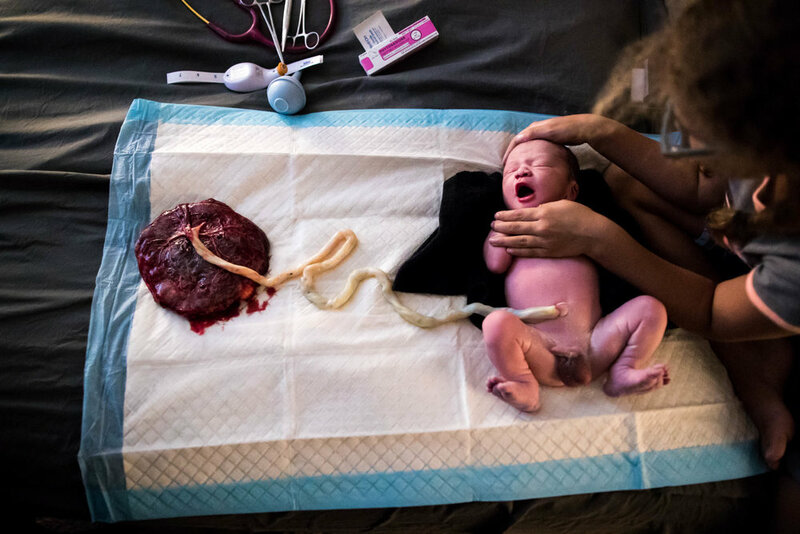 "Why the homebirth? Having had 2 hospital births (and one in between at a birthing center), I knew that I wanted something completely different this time. 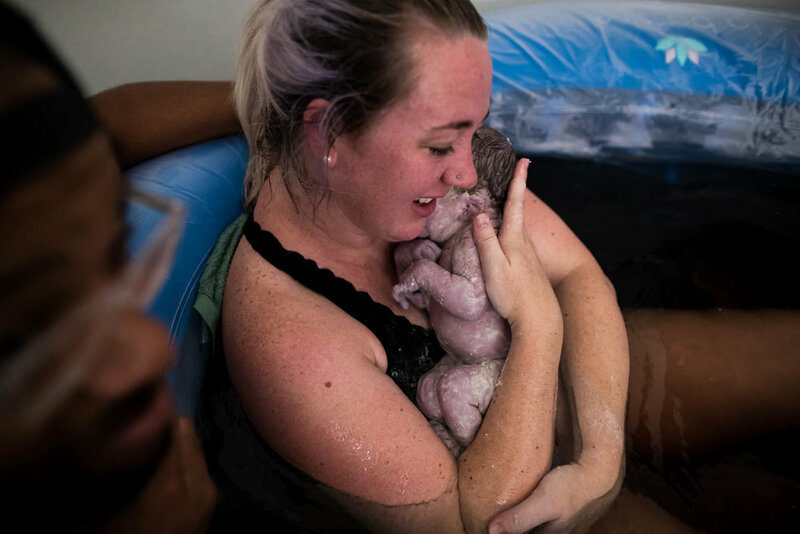 Birth can, and I dare say *should*, be a beautiful experience that’s exactly what YOU want it to be since it’s YOUR experience. #youdoyou The hospital experiences I had were very triggering for my panic disorder and ptsd; even just the security doors that clicked and locked behind me on the maternity floor made me instantly feel trapped and claustrophobic. The IVs and monitors in the hospital have that same tethered feeling for me of being tied down and trapped. One of the only natural reliefs I have found to be helpful for myself is to be outside breathing the fresh air and that feeling of freedom to help bring down the feeling of panic when it starts to rise. I thank God for you ladies. So here’s how it happened: I was still 10 days from my due date, but my blood pressure was starting to creep up, not crazy yet, but headed that way, which would have turned this into a hospital birth in a hot second if we weren’t proactive about this. I’m grateful that Teri keeps a vigilant eye on her patients, and also on what the goals are and how to manage both. Together we decided that a slow, gentle induction at home while my BP was still just elevated was the best option for my homebirth goal than to wait for the inevitable scary high BP that would negate the homebirth option for me again. Even though I was scared, anxious, and didn’t feel ready, I’m so glad that I trusted her and together we did it! Once labor contractions actually started it was only 5 hours from start to finish (not counting an hour of sporadic contractions before that when I was walking all over Collin Creek mall like a crazy person - I kinda wonder what people thought who saw me walking laps and going up and down the stairs at a bouncing jog pace 🤣). Knowing myself and my need for freedom, we decided to set up the birth pool outside and prepared to have a backyard birth...I mean if you’re going to do it your way, then really do it your way, amiright?? The August weather in Texas is....hot. Like really, absurdly hot. On August 5, we had unusually cooler weather (think highs in the upper 90s instead of 110! ), and due to the timing of the contractions starting so late in the afternoon, we were able to get the perfect outside temperatures (it was like 79° 🙌), golden hour lighting, and then I got to birth and catch my own baby on a perfectly clear evening under the stars with no mosquitos. It was beautiful to be empowered and surrounded and supported 100% of the experience by my dream team. The sun went down at about 9, and she was born at 10:14pm, weighing 7lb 4oz, and 19 inches long. Hank (10) was so helpful keeping Rex (3) and Ash (1) inside the house; he fixed them dinner, got them in their pjs, and watched The Rugrats movie with them to keep them entertained. Ash fell asleep first, but Rex and Hank were both awake and came outside moments before Opal was born and got to be there as their sister arrived and took her first breath. TL;DR: I did a thing and had my baby outside, on purpose." This birth deserves a structured status to explain how awesome it was. 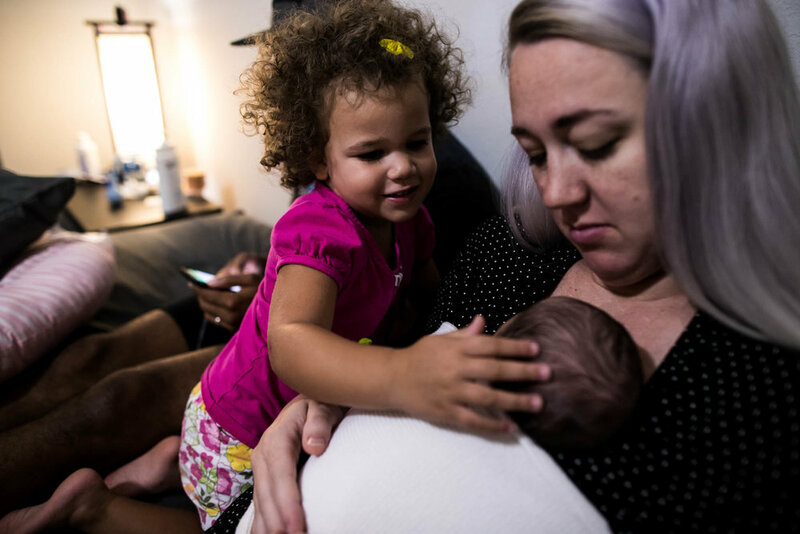 - What first and foremost I wanted to highlight was how incredibly hard Lindsay worked to get baby here. 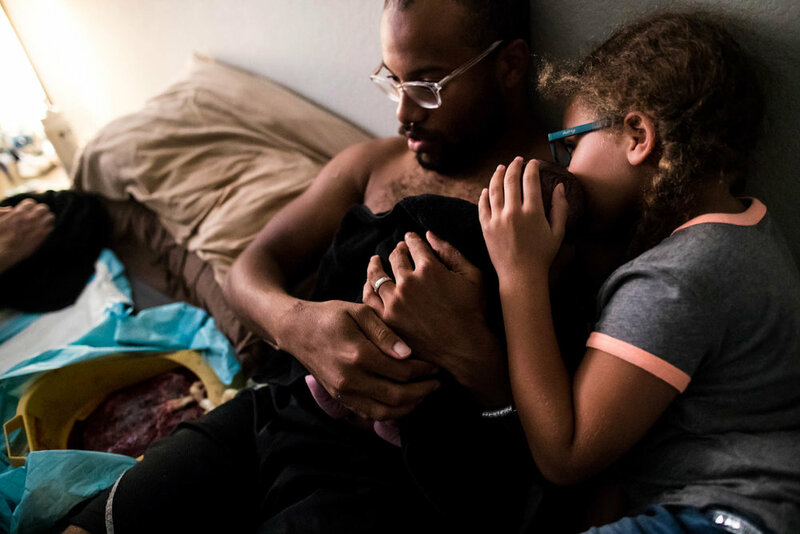 Like contracting for weeks, harder and longer labor (rare for third baby), on top of overcoming all the emotional obstacles difficult labors bring. She was 110% boss babe and I loved watching every second of her strength. - She had her kid outside under the stars. OUTSIDE. STARS. YUP. - Somehow I've been blessed with not one but two films recently featuring doggie doulas. And spoiler alert, a kitten shows up too. Pet parents everywhere will give this two thumbs up. - Another surprise gender birth. Dad's reaction is 💯. - Big brothers and sisters? Check. And they're all sleepy and confused possibly but holy cow so cute. "Have you ever witnessed something magical? I mean, truly magical. In that very moment you know you are in the presence of something special and you feel God's energy wrapping the entire space in His arms and pouring love and peace and power in to every one. This is what I felt when I was present at the birth of Alíenor. Every one of us in the space rallied together, taking turns loving on Jennifer as she embraced her holy work bringing new life to Earth. I'll never get over it. That feeling, that energy we are gifted as birth workers. When the energy of the room is colorful and pulsing from Mother to each one of us. We get to be part of an experience like NONE other. There is nothing like it. " Not a Dry Eye for this blessing.